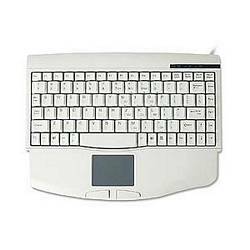 Thin, compact, and lightweight, this super-performing and full-featured keyboard/touchpad combination is comfortable on your lap on your desktop! Soft, half-stroke keys are solid to the touch. Requires PS/2 port-equipped PC and Microsoft Windows 95/98/Me/2000/XP/Vista.